‘I am a storyteller. I travel to collect stories, and I return to tell the stories of one place to the people of another. That is the important part of the trade. You must never tell people their own stories. They have no interest in them, or they think they can tell them better themselves. Give them a stranger’s life and then they’re content. Sometimes, some books take us back to that territory of the Realm of imagination where our love for fiction was born. We may have preserved some hold on it through our whole life, but I reckon that we tend to impede the accesss to that Realm with no end of obstacles named sophistication, cynicism, realism, avant-gardism, postmodernism, conventionalism, deconstructivism o whatever your favourite group of -isms might be. Far be it from me to deny the virtue in any of those resources when adequately used, and indeed I’m among the firsts to joyously raise my little finger whent the breakthrough writer of the day manages to surprise me with his or her last rethorical pirouette. 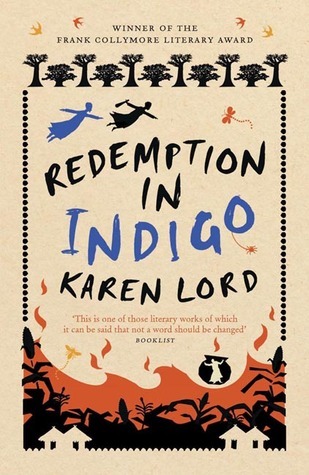 But when a writer is able to manage that same level of surprise using the exact opposite mechanism, writing a seemingly straightforward -never less than elegant- text, so firmly grounded in the tradition of oral storytelling, as this Redemption in Indigo written by Karen Lord, both my pleasure and my admiration skyrocket. Redemption in Indigo is a short novel that reminds me, in several ways, of “A Christmas Carol” by Charles Dickens in reverse. The novel depicts a world bursting with djombi -more or less benign or malignant spirits of shifting loyalties- whose eternal lives are devoted to help (or to pester) humans. We will follow one of these djombi whose faith in the human kind has withered in his dealing swith Paama, a coraugeous woman who has confronted tradition in order to flee a husband ruled by gluttony. While this is not an indulging novel, it has an undisguised positive attitude and a willingness to convey a moral, though who is the character in the story to whom the lesson is addressed is a curious choice (hence my mention to a reversed “A Christmas Carol”). My guess is that the tone of this story will remind most readers of some well-known fables read in some form or other. The narrative voice of Lord perfectly matches this approach and one of her achievements is to endow her invented world with a complexity that doesn’t condone the folklore character from which some of the uniqueness of the text derives, perhaps (I wouldn’t dare to be categorical about that) arising from the Caribbean origin of Karen Lord. And, as so often happens in the movies, once the credits are complete a little epilogue is found both surprising and enticing, that leaves us asking for more, more, more! 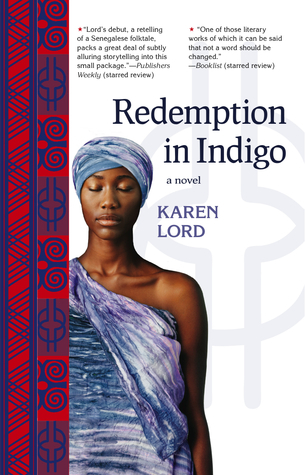 What will you find in Redemption in Indigo? Magical objects, spirits disguised as animals, three (as custom has it) elderly priestesses that in my european tradition would be either good witches or goodfairies, Chaos sticks, ghosts, exotic landscapes, instant teleportation, time travel! What you will realy find is a magnificent tale that will help you remember why imagination is important. Karen Lord writes in a style both straightforward and elegant, chosing a very personal narrative voice that addresses the reader breaking the fourth wall whenever she deems it necessary. I have some minor issues with a character whose appearances throughout the story seem a little bit discordant to me, but I blame my limitations rather than the text itself. Overall, this is a really impressive debut, owing in no small part to its simplicity. I highly recommend it to anyone interested in fantastic literature.